We wish there was a way for your bill appear in the form of a warm hug, the same warmth you get when you enjoy the benefits of natural gas, but unfortunately, that kind of technology doesn’t exist … yet. Don’t worry, the calculation of your cost isn’t as hard to understand as it might look at first. In cubic metres or centa-cubic feet, based on the meter reading. Used to convert your gas consumption to Gigajoules. Current year vs. previous year consumption. Includes balance and monthly charge. Difference between EPP payment requested to date and the actual charge to date. This amount is your credit or charge to date for your settlement month. Reminder that you are signed up for the Pre-Authorized Payment Plan. Your current rate class. See the back of your bill for a full explanation. For the current billing period. A monthly fixed charge to cover costs such as a meter reading, pipeline maintenance, customer support services and 24-hour emergency service. The charge for the distribution of natural gas through our pipeline to your property. The cost of the natural gas supply that you use. 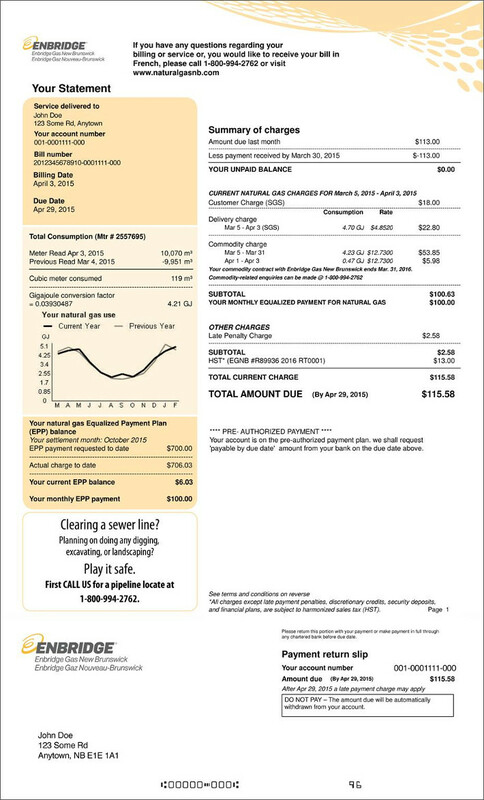 If you have a contract with a Gas Marketer other than Enbridge Gas New Brunswick, you may be billed separately for your supply. Such as finance plans and service charges. Includes any previously unpaid charges. A late payment charge of 1.5% will be applied if received after due date.